Evolution does seem to turn many Christians into unbelievers. A famous example is the distinguished Harvard biologist E.O. Wilson. Wilson writes that when he discovered evolution he felt a profound sense of intellectual liberation from his Baptist upbringing in the South. Evolution also makes some people secular evangelists for the Darwinist cause. Michael Shermer was an evangelical Christian studying at Pepperdine University when his study of evolution convinced him to give up his faith. Now the editor of Skeptic magazine, Shermer has become a kind of missionary for the atheist point of view. So does a belief in evolution automatically lead to disbelief in God? Actually, Darwin didn't think it did. Darwin was not an "intellectually fulfilled atheist"; rather, he called himself an "agnostic." Atheists say God does not exist while agnostics say they don't know one way or the other. Moreover, Darwin didn't boast about his unbelief; rather, he approached it with marked public caution. Shocking the mores of traditional believers may be Dawkins' thing but it certainly wasn't Darwin's. Here we must distinguish between Darwin the scientist and Darwin the unbeliever. Darwin, who was raised Anglican and even considered becoming a clergyman, did eventually relinquish his Christian faith. But he did not do so because of evolution. The story is told in Adrian Desmond and James Moore's authoritative biography Darwin: The Life of a Tormented Evolutionist. Desmond and Moore point out that Darwin lost his faith many years before his publication of his magnum opus on evolution. When his young daughter Annie died at the age of 10, Darwin came to hate the God whom he blamed for this. This was in 1851, eight years before Darwin released his Origin of Species. Around the time of Annie's death, Darwin also wrote that if Christianity were true then it would follow that his grandfather Erasmus Darwin and many of his closest family friends would be in hell. Darwin found this utterly unacceptable, given that these men were wise and kind and generous. Darwin's rejection of God was less an act of unbelief as it was a rebellion against the kind of God posited by Christianity. A God who would allow a young girl to die and good people to go to hell was not anyone that Darwin wanted to worship. Now when Darwin published his work on evolution, the American biologist Asa Gray wrote Darwin to say that his book had shown God's ingenious way of ensuring the unity and diversity of life. From Gray’s point of view, Darwin had exposed divine teleology. Darwin praised Gray for seeing a point that no one else had noticed. In later editions of his books, Darwin went out of his way to cite the English writer Charles Kingsley, who described evolution as compatible with religious belief. To the end of his life, Darwin insisted that one could be "an ardent theist and an evolutionist." So why didn’t Darwin correct his over-enthusiastic advocate? Here is where the story gets complicated. Over time, Darwin's hostility to Christianity did play a role in his scientific views. While Darwin was originally very modest about evolution--a theory to account for transitions from one life form to another--he became increasingly insistent that evolution was an entirely naturalistic system, having no room for miracles or divine intervention at any point. 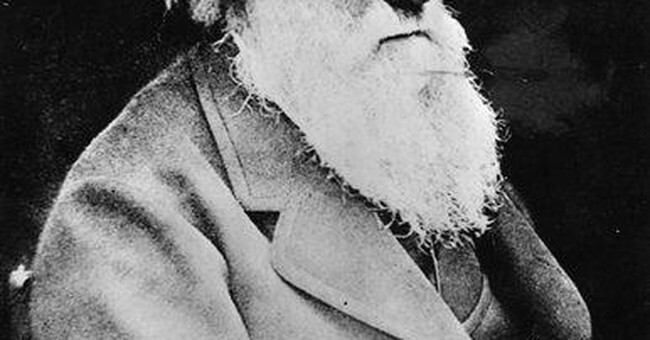 When Darwin's co-discoverer of evolution, Alfred Russel Wallace, wrote him to say that evolution could not account for man’s moral and spiritual nature, Darwin accused him of jeopardizing the whole theory. “I hope you have not murdered too completely your own and my child.” Darwin's ultimate position was that it was disastrous for evolution to, at any point, permit a divine foot in the door. This history is important because we can embrace Darwin's account of evolution without embracing his metaphysical naturalism and unbelief. Dawkins, Provine and others are in a way confusing the two faces of Charles Darwin. They are under the illusion that to be an evolutionist is essentially to be an atheist. Darwin, to his credit, rejected the equation of these two stances as illogical, even if he didn't always maintain, within his own life, a clear distinction between his science and his animus toward God.